The Smithsonian’s National Museum of Natural History has announced that the Nation’s T. rex has returned to the museum where it will be the centerpiece of the new 31,000-square-foot fossil hall opening June 8, 2019. 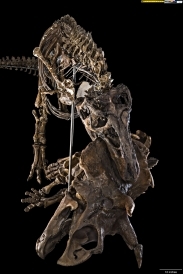 The Tyrannosaurus rexskeleton will be featured in the reopened hall alongside more than 700 specimens, including dinosaurs, plants, animals and insects, some never before displayed at the National Museum of Natural History. The exhibition will depict a journey through time of more than 3.7 billion years of life on Earth. Visitors will discover their impact on life’s story as it plays out today and their role in shaping its future. The National Museum of Natural History is connecting people everywhere with Earth’s unfolding story. It is one of the most visited natural history museums in the world. Opened in 1910, the museum is dedicated to maintaining and preserving the world’s most extensive collection of natural history specimens and human artifacts. The museum is open daily from 10 a.m. to 5:30 p.m. (closed Dec. 25). Admission is free.